It’s a poorly-kept secret that I don’t have very much of a sweet tooth, despite the amount of baking that I do. I much prefer more spiced or lighter desserts like carrot cake, apple cobbler, and tiramisu. That is why I LOVE the fall and winter season — that’s when the spiced desserts come out to play! From pumpkin pie to gingerbread, these are the desserts that I especially enjoy making and devouring! I took the opportunity during this season to concoct a recipe for a Spiced Maple Pecan Cupcake with Maple Cream Cheese Frosting. I started with my normal vanilla cupcake recipe, and substituted the white sugar with brown sugar instead, being sure to check the internet that this wouldn’t ruin the texture or form of my cupcake. Baking is such a chemical science, that you risk an imploded or exploded result if you substitute ingredients incorrectly! I then added some of my favorite fall and winter spices for baking: cinnamon, nutmeg, clove, ginger, and allspice… similar to what you would put into a pumpkin recipe. All right, we’ve taken care of the “spiced” part of Spiced Maple Pecan, now for the “maple” part! Instead of vanilla, I wanted to use a maple flavoring. Googling around, I found that most maple recipes required a few cups of pure Grade B maple syrup. I was a little concerned as to what 1-3 cups of liquid would do to my cupcakes, and I had heard anecdotes that when you use the syrup, you don’t even get that familiar maple flavor that most people are used to. I contemplated a bit, but then decided I didn’t feel like dealing with failed cupcakes that day. Therefore, I opted to use the imitation maple flavoring by McCormick’s for my cupcakes and frosting. Amusingly enough, I later had a conversation with Nam herself, and she also prefers the imitation maple flavoring over the maple syrup! Now for the best part… candied pecans! Making candied pecans is pretty easy, and it makes a HUGE difference when using candied pecans instead of regular pecans. It is everyone’s favorite part! The hardest thing about making candied pecans is trying not to eat them all yourself, and running out before they even make it into the cupcakes. I incorporated these babies into the cupcakes themselves and also sprinkled them on top of the maple cream cheese frosting. The resulting cupcake was a hit! Everyone loved them, and I even got a comment that, “He normally hates cupcakes, but he loves these!” And I thought, “That’s because they’re not too sweet, and spiced instead!” I hope you try this recipe out and love them too! 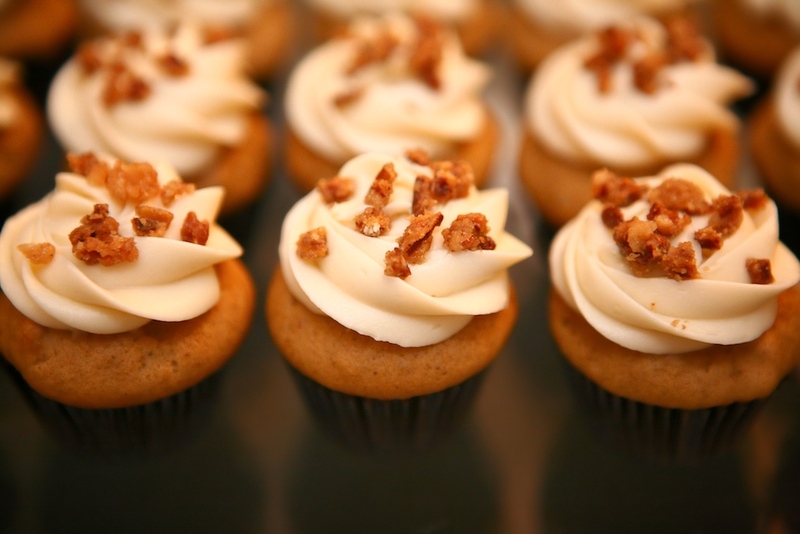 Spiced Maple Pecan Cupcakes by Carol L.
1. Combine flours, sugar, baking powder, salt, and spices; stir with a whisk until combined. Add butter and mix with an eletric mixer. 2. In a large glass measuring cup, whisk together eggs, milk, and maple flavoring. 3. With mixer on medium speed, add wet ingredients in 3 parts. Mix until combined, but do not overbeat. 4. Dust the candied pecans with some flour (this keeps them from sinking to the bottom of the cupcakes). Mix in the candied pecans. 5. Divide among cupcake liners. Bake at 325° until toothpick comes out clean. 1. Beat butter vigorously with an electric mixer. Scrape the bowl and add the cream cheese. Beat until combined. 2. Add 2 cups of powdered sugar and beat until smooth. 3. Add the maple flavoring and mix. 4. Continue to add powdered sugar until desired consistency for piping. 1. In a pan, mix white sugar and pecan pieces. Turn on the heat to medium, and slowly stir with wooden chopsticks or spoon until the sugar starts to melt. 2. When the mixture becomes a nice brown color, remove from heat, and continue to stir until cooled. Careful, it can go from golden brown to burnt surprisingly quickly! If you don’t continue to stir until cool, it will all harden together in one big clump. 3. Once cooled, crumble and break apart any pecans that are stuck together. *Reminder: You, too, can be a Guest Blogger of The Culinary Chronicles! Submit all entries to theculinarychronicles@gmail.com and be eligible to win an AWESOME Foodie Prize! Wow! Those cupcakes look amazing and perfect in shape. Beautiful! Those candied pecans look great! @rachel Thank you!! Super easy to make candied pecans, even just for a snack by themselves! 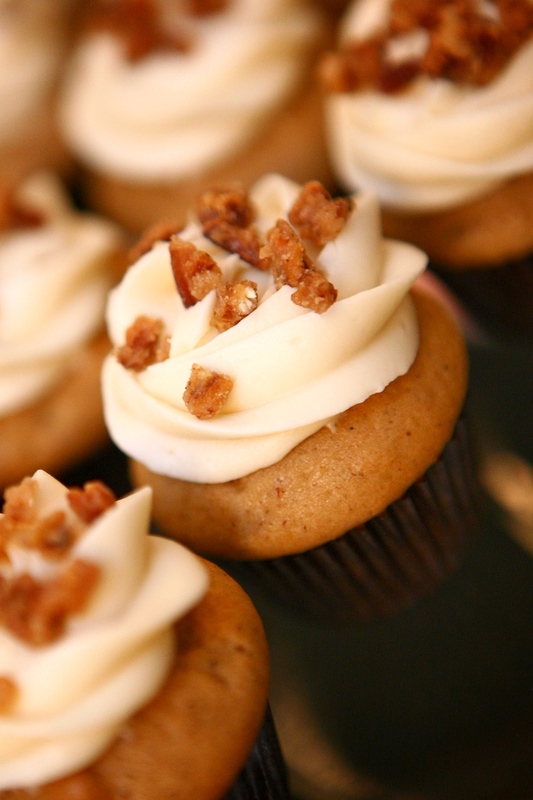 Omigosh, I thought there was bacon bits on top of your cupcakes and I though “OOoooh, Brilliant idea!” lol…but Candied Pecans are also delish! Thank you for posting one of your many specially created recipes! I’m glad I’ll have a “Carol Original” in my recipe library. Hi-saw these and just had to make them!They taste great, but don’t look nearly as nice as yours…. I’d love just a bit more info. How many should the recipe make? Approx. how much should one put in each cupcake liner? They rose more than I thought and spread all over the top of the pan. And can you give an oven time estimate? Also, how long should one wait until frosting them? Thank you! Hi Megan! This recipe should yield approximately 16 regular-sized cupcakes. The liners should only be filled 2/3 full. Oven time is around 17-20 minutes, but I found this varies by the oven, so a clean toothpick is a great method! Hope that helps! Rose, I’m so glad you liked them! I will def. pass the word on to Carol. Cheers!